The rechargeable Li-Ion battery can last 5 hours on a single charge or enough for 300 grinds and with the LED battery display on the front of the unit, you’ll know when it’s time to plug in. USB charging cable included. 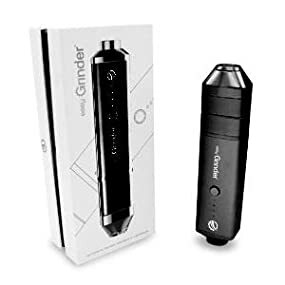 Convenience that fits in your pocket, your easy Grinder TM automatic herbal grinder & dispenser is ready when you need it to be. 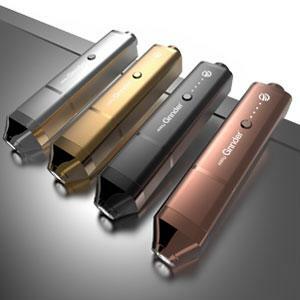 Whether it’s loose tobacco, medicinal herbs or seasoning for dinner around a campfire, the powerful grinding blades can take up to 2.5 g of product with the press of a button. The longer you grind, the finer your herbs, and the included brush makes for an easy clean up. 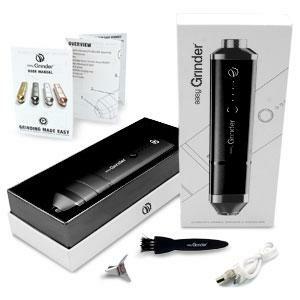 Another unique feature of the easy Grinder allows you to detach the nozzle, loading chamber and end cap so that you can combine them into a secure and compact carrying case for herb on the go! The secure o-rings around the storage chamber make for an airtight seal so you can discreetly party with your best buds. 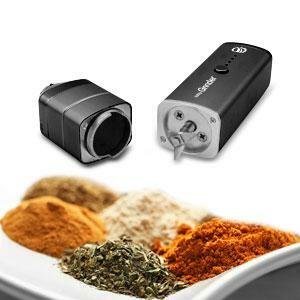 Powerful grinding blades can grind up to 2.5 g of herbs as fine or as coarse as you need. Grind up to 5 hours on a single charge or over 300 grinds. 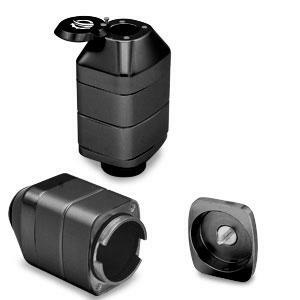 Detachable storage case can be used as a manual grinder when no charge is left.